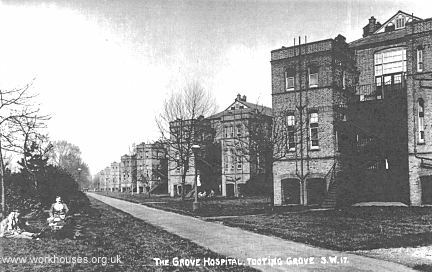 Tooting Grove in Tooting was the location for another of the five fever hospitals erected by the Metropolitan Asylums Board in the 1890s. The MAB had been set up in 1867 to administer care for certain categories of the sick poor in metropolitan London. In 1891, its responsibilities were extended to include the provision of fever and infectious diseases hospitals for all the capital's inhabitants. This expansion, coupled with an acute shortage of beds during a scarlet fever epidemic in 1892-3, led to the construction of five new fever hospitals beginning with the North-Eastern Hospital at Tottenham in 1892, the Fountain Hospital also in Tooting in 1893, the Brook Hospital at Shooter's Hill in 1896, and the Park Hospital at Hither Green which opened in 1897. The Grove was the last new fever hospital to be constructed by the MAB. The site for the new hospital lay immediately to the south-west of that on which the temporary buildings of the Fountain Hospital had been hastily erected in 1893. 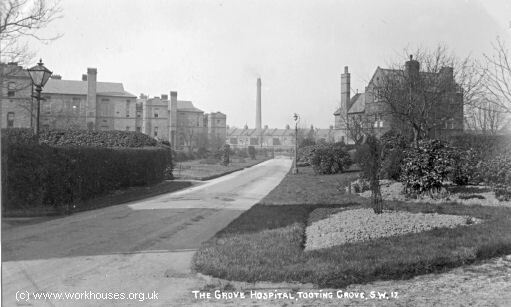 The Grove was located between Tooting Grove at the north, and Blackshaw Road at the south, and covered an area of around 23 acres. The architect for the scheme was A Hessell Tiltman. His design broadly placed the administrative and staff buildings at the south east, and the medical blocks at the north-west of the site. Covered ways linked all the ward blocks with the administrative blocks and laundry. Grove Hospital site from the north-east, c.1930. Grove Hospital adminstration block, c.1908. Eight parallel ward blocks for scarlet fever patients was placed along the south-west side of the site in a "semi-echelon" arrangement. Their north-south orientation was intended to maximise the amount of air and sunlight available. Each pavilion block had two ward floors with the upper floor having its own staircase from the covered way. Each floor contained a 20-bed main ward and a 2-bed side-ward, together with scullery, linen cupboard, nurses' lavatory, store room, trolly room, and storage for a portable bath. Each bed in the ward had a window at each side of it. Self-contained cross-ventilated sanitary blocks containing baths and WCs were placed at the far end of each ward together with an escape staircase. Each ward block thus provided 44 beds, giving an overall total of 352 scarlet fever beds. A small reception block for new patients was placed next to the covered way. The space between the ward blocks was used as airing courts. Grove Hospital scarlet fever ward plan, 1903. To the north of the scarlet fever blocks were six single-storey isolation blocks. Two of these contained four two-bedded wards, two contained two four-bedded wards and single-bedded rooms, and the others had six-bedded and two-bedded rooms, allowing for great flexibility in the use of the accommodation. At the north of the site were placed a row of four ward blocks providing beds for a total of 112 diphtheria and enteric fever patients. These blocks were scaled-down versions of the scarlet fever pavilions with their main wards having only 12 beds. A separate reception block was provided for new patients entering these wards. 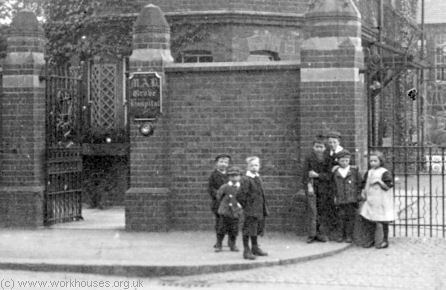 Grove Hospital scarlet fever wards from the south, c.1910. 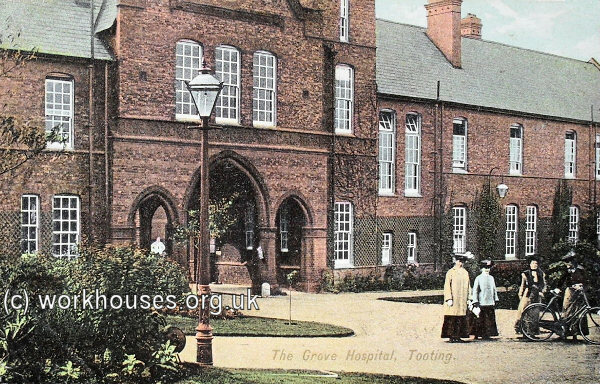 Grove Hospital diphtheria wards from the east, c.1910. At the east of the isolation blocks were placed the single-storey laundry and boiler house. Immediately to the north stood the main administration building. Staff quarters lay along the eastern side of the site, set among gardens and recreation grounds. At the southern end were three separate three-storey blocks for night charge nurses, night assistant nurses, and day assistant nurses. Further north lay two further three-storey blocks for day charge nurses and day assistant nurses, two blocks for domestic staff, and a charge nurses' block containing recreation and lecture rooms. At the north-east corner were located the mortuary and medical education blocks. 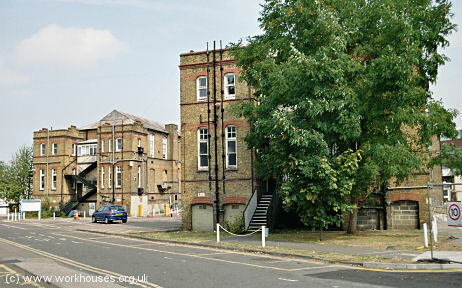 The site entrance on Tooting Grove comprised a porter's lodge, waiting room, and discharge block where leaving patients could change out of their hospital garments, bathe, and put on their own clothes. An accommodation block for male staff lay to the south-west of the entrance, and the medical superintendent's house to its west. 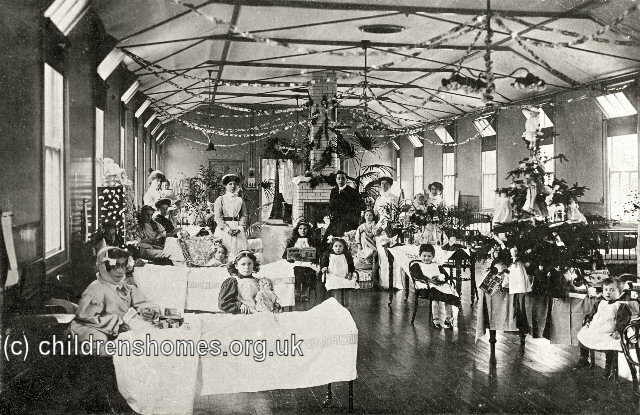 Grove Hospital children's ward, c.1908. During the First World War, the Grove was one of the MAB institutions that were requisitioned by the War Office for military purposes. The Grove operated as a 550-bed military hospital between 11th November 1916 until September 1919 during which time it treated 2,499 officers and 13,459 other ranks. Special sections of the hospital were earmarked for infectious diseases, tubercle of the lung, skin, scabies, and venereal cases. 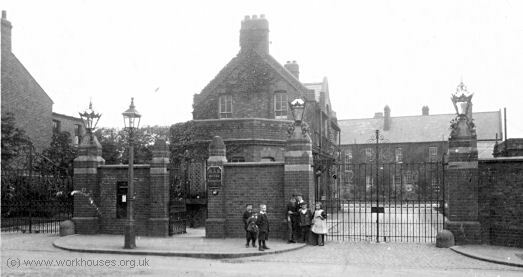 Grove Military Hospital entrance, c.1917. Grove Military Hospital entrance (detail), c.1917. 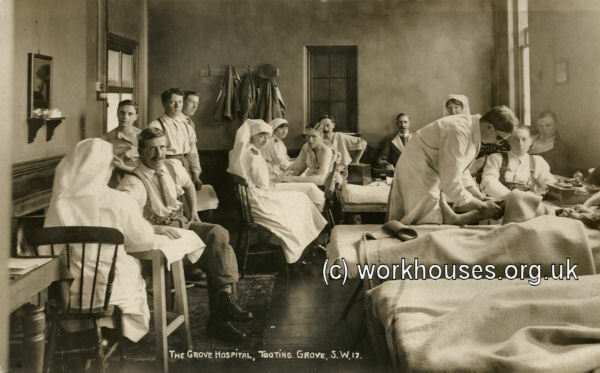 Grove Hospital military patients, c.1917. Later additions to the buildings included a new two-storey isolation block at the north-west of the existing isolation blocks, and two new blocks linking the existing nurses' accommodation at the south-east of the site, one erected in the 1920s, the other in 1935. Grove Hospital scarlet fever wards from the south, 2004. Grove Hospital nurses' accommodation from the south-east, 2004.